Last week Rob lent me his copy of Everything is Miscellaneous by David Weinberger the co-author of the Cluetrain Manifesto. It’s a mesmerizing book in which Weinberger talks about organistion, hierarchy, authority and knowledge. The first thing that I noted and didn’t fully understand until I had finished the book ( and perhaps I still don’t ) was the rather cryptic dedication at the beginning of the book – To the librarians. By the time I finished the book I was left wondering whether David was thanking them for their efforts, thanking them for nothing or simply telling them that they no longer have a function. To put this in context the book is very much about the history of library science and information architecture in general. Historically we have divided the world into vast categories, subject, topics and hierarchies because real world, physical objects need to be in one place or another, they can’t necessarily be in all the places they might actually belong. The advent of the computers and more specifically the internet has pretty much turned this whole thing on its head, we can now classify objects and even knowledge almost idiosyncratically. We are now becoming aware of how limited the previous hierarchies were which tried to compartmentalise things to make them easy to find ( Dewey Decimal) but in doing this we create a very narrow view of the world. It’s also one that is unfortunately open to abuse, or rather it suffers from biases that inherently lurk in those systems that we create. It would seem that Wikipedia does everything in its power to avoid being an authority,yet that seems only to increase its authority – a paradox that indicates an important change in the nature of authority itself. Discovering what you want is at least as important as finding what you know you want! Everything is Miscellaneous is a wonderful book and I thoroughly recommend it. 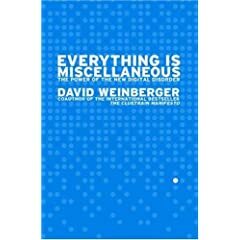 This entry was posted in Books and tagged Books, david-weinberger, everything-is-miscellaneous by Nadeem. Bookmark the permalink.